Voice Advantage allows you to conduct real-time face-to-face interviews. 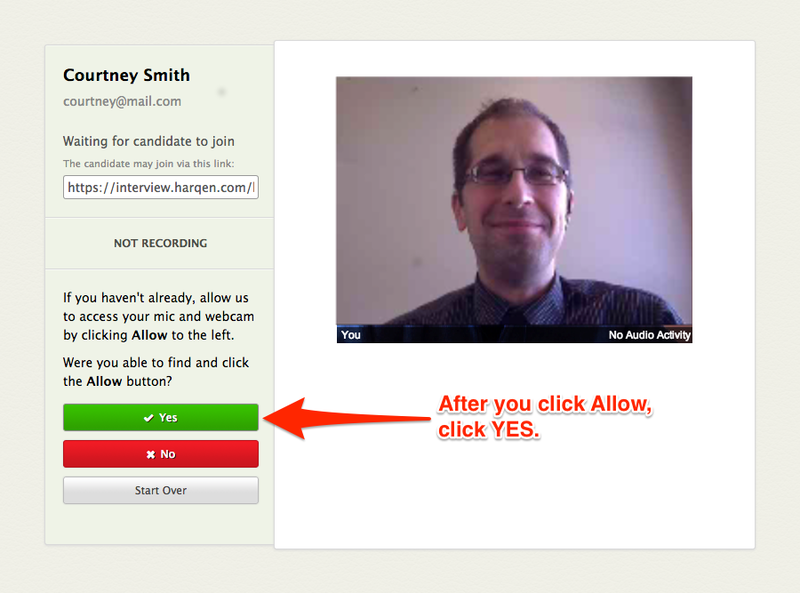 Click Live Interviews in the top navigation bar from anywhere in Voice Advantage. Enter the name and email address of the person you would like to interview. 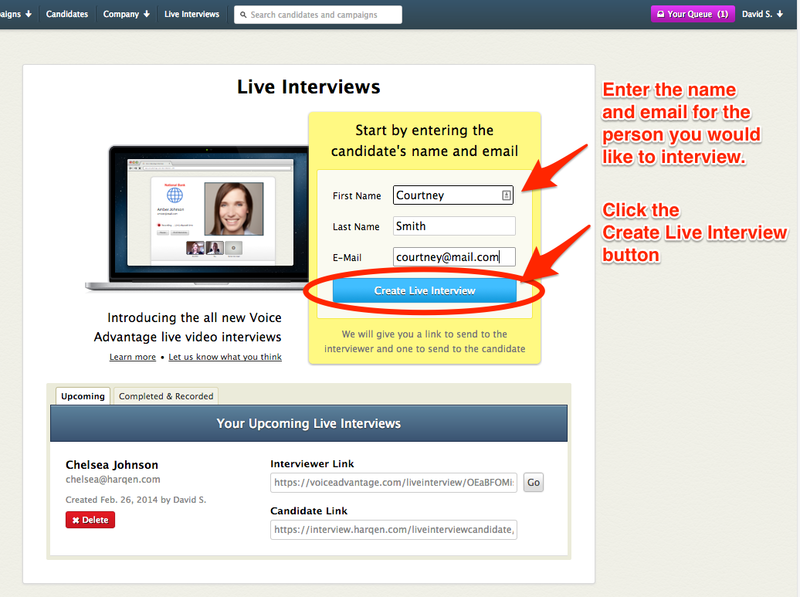 Then click Create Live Interview. Click on the Candidate Link to highlight it. 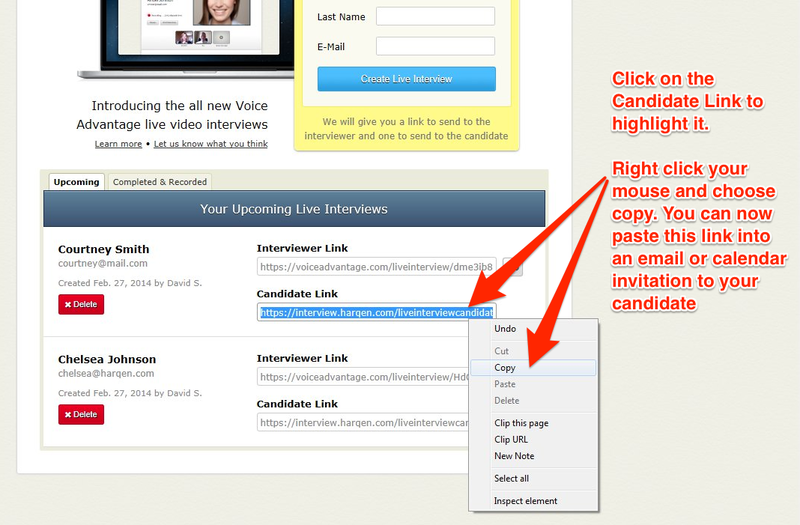 You can now copy and paste this into an email, chat or calendar invitation to share with your candidate. 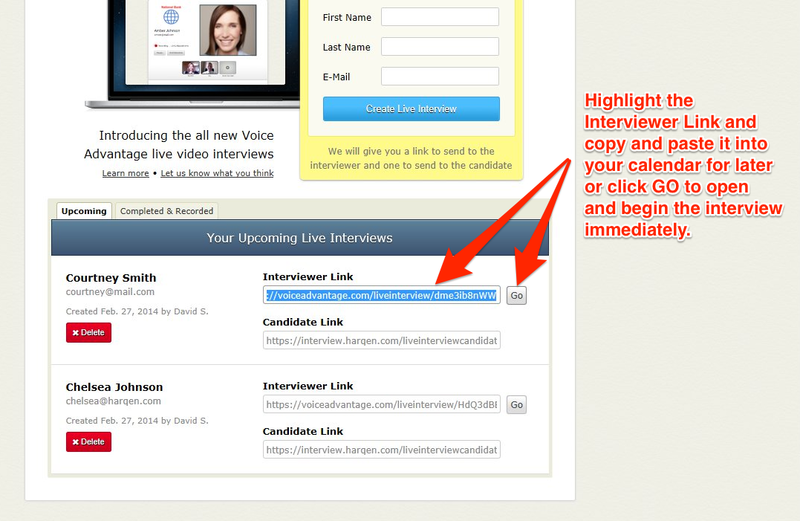 Click on the Interviewer Link to either copy and paste it into your calendar application or click the GO button to enter the interview room and begin testing your setup. 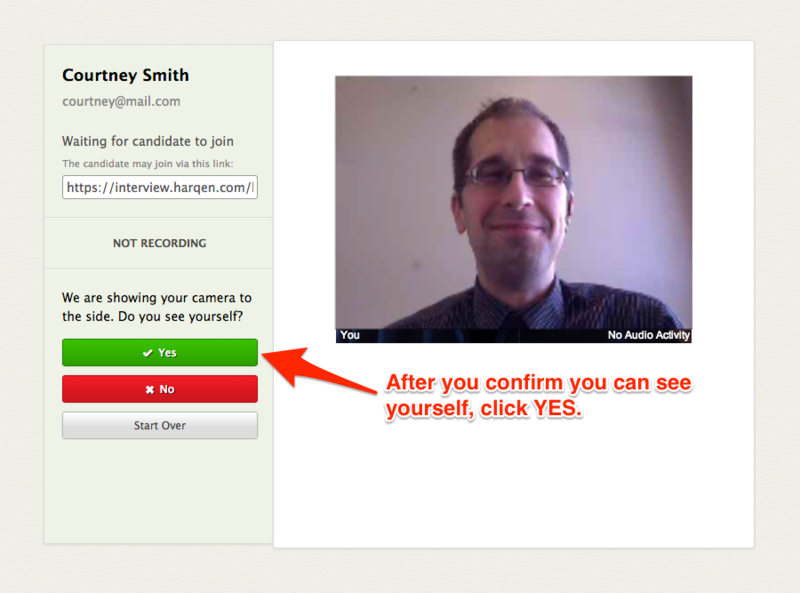 When you enter the interview room, you will be able to test your webcam and audio setup. 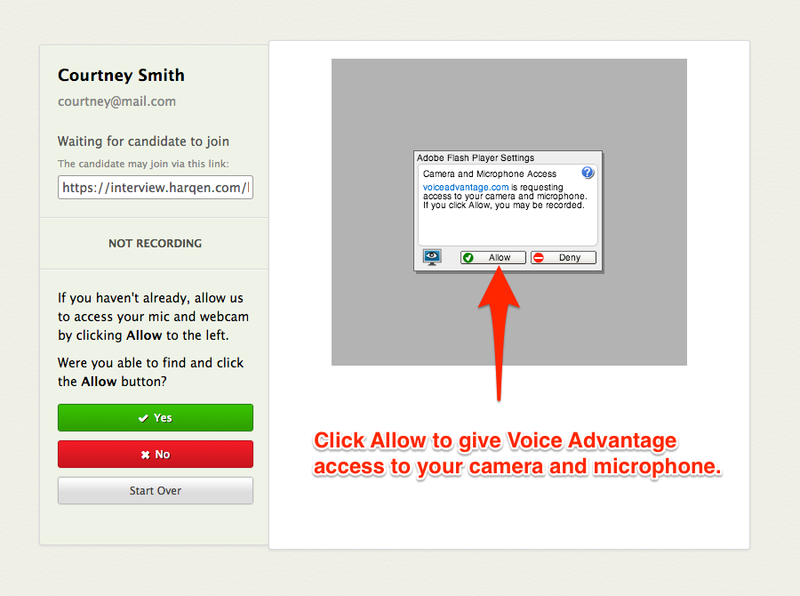 Prior to beginning a Live Interview in Voice Advantage, you will be given the opportunity to test your webcam and audio settings. Here is a walk-through of that testing process. 1. You will need to give Voice Advantage access to your webcam and microphone. Click Allow in the Adobe Flash Player Settings box. 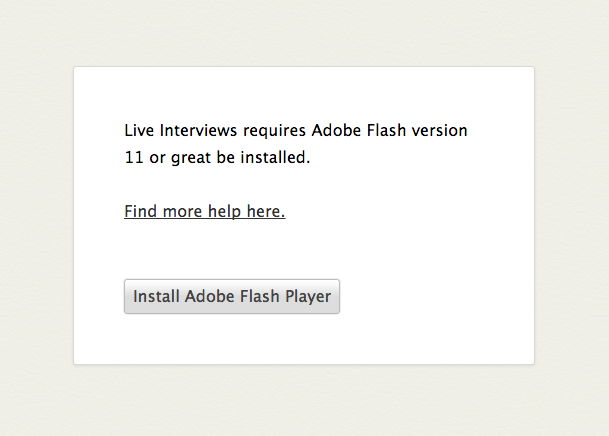 Live Interviews requires Adobe Flash to be installed to function properly. If you see the error message below when entering the interview room, you will need to install Adobe Flash. After you click Allow, click the Yes button on the left. Confirm your webcam is working properly and you can see yourself. After confirming your webcam is working, you will test your audio settings by speaking briefly. Best Practice Tip: Most people who conduct Live Interviews use their computer speakers to hear the other person. While this will work, we recommend using headphones. This will let you hear the candidate more clearly and reduce the amount of feedback that can result from your computer’s speakers being close to your microphone. Remember also if you are using the webcam’s built-in microphone, you will want to position yourself close to it so the other person can hear you clearly. A great alternative for excellent sound quality is to use a microphone/headset combo. When you speak for the test, you will hear yourself echo back. This is normal and the echo will not be present during your interview. 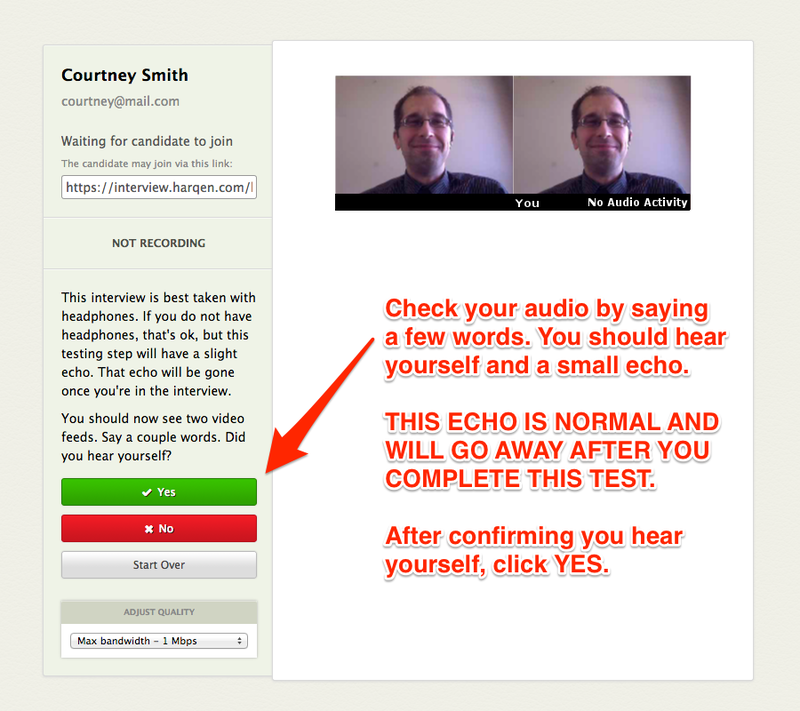 The echo allows you to check that you can hear yourself after you speak. After you confirm you can hear yourself, click Yes. 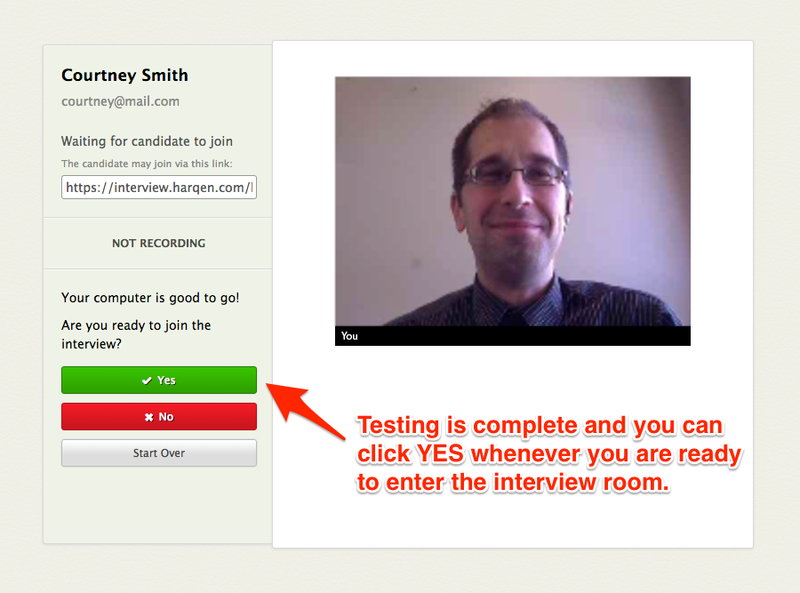 After you confirm your audio settings, your testing is complete and you may enter the interview room. If you are having technical problems with your video interview, there are two common issues to check that resolve 95% of the issues candidates encounter. Adobe Flash version 10 or higher is needed for your video camera to work properly. Check which version of Adobe Flash you have installed on your computer. If you don’t have Adobe Flash installed, ‘you can download it here http://get.adobe.com/flashplayer’. Sometimes your microphone or speakers are turned off or disabled. Be sure that your computer has speakers or headphones, and double check that they can play audio. This is required for you to hear the interview questions. A microphone is required to record the audio portion of your interview. Double check that your computer has a microphone and that it is enabled. 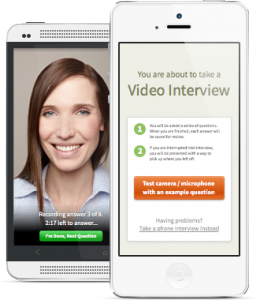 If you have an iPhone or Android phone with camera, you can take your interview with our Mobile App. Click on the link that started your interview from your phone. Enter your name and email if requested and complete any text questions for the interview. Voice Advantage will identify which device your have (iPhone or Android) and take you to the iTunes Store or Google Play Store to download that app. Install the app and you will resume the interview process. If none of these option solve your problem, email support@harqen.com and we will work with you to address the issue.